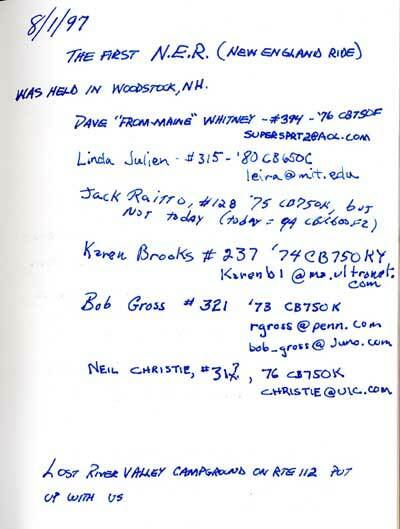 The Ride Book was an idea hatched in 1997 by Linda Julien to commemorate the First New England Ride (NER). On the first page, it is written, “This is Volume I of many of the Journals of the Honda Single Overhead Cam-4 Owners Group”. And so it began. 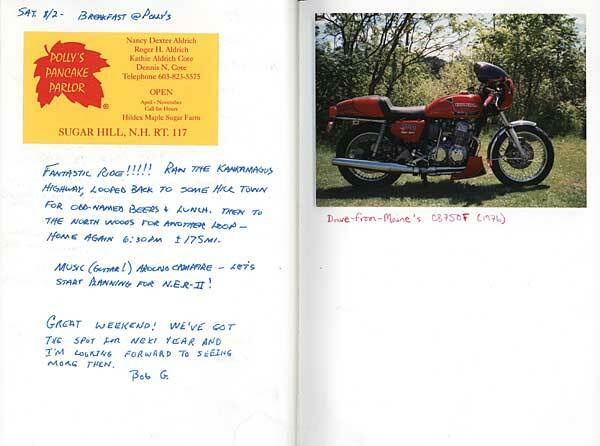 The Journal, or the SOHC/4 Ride Book, as it later became known, was sent around the world to various SOHC/4 events in 1997 and 1998. 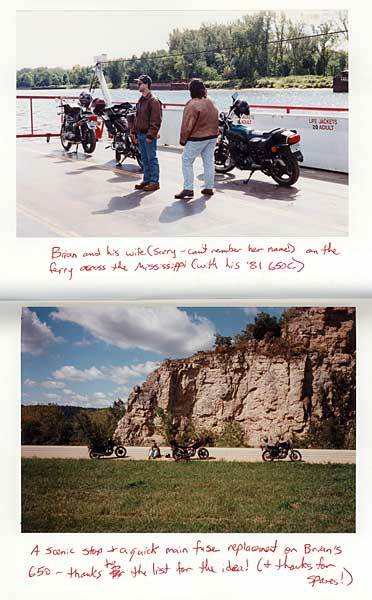 Events recorded during this third year of the Club’s existence included the First NER, the First WER – West European Ride, the First Mid-West Ride, MWR, and the Honda Hoot Gathering in June 1998. The East Coast SOHC/4 Gathering was a lunch time gathering of some of the mid-atlantic region members that took place in Easton, Maryland on December 6, 1997. Attending were Glenn Stauffer, Bruce Giller and his wife Jane Prive, Doug Barton, and Andrew Price. The First Annual WER took place over several days beginning on 8/16/97. The ride centered on Ghent, Belgium with forays to Nieuwport, Ostend, and Brugge. The Honda Hoot, Ashville, NC, June 1998 The 1998 Honda Hoot in Ashville, North Carolina was the occaision for another gathering of the SOHC/4 faithful. Attending this gathering were Steven Barber, Airyn Darling, Phil Jeffey, Glenn Stauffer, John & Reneee Hilpertshauser, Lloyd Horton, William McNulty, Bruce Giller, and Dave Myers. The inaugural MidWest Ride took place on 9/20/1997 starting in Dubuque, Iowa and followed the Great River Road along the Mississippi through Iowa, Illinois, ending up in Prairie de Chien, Wisconsin.